I check my plants for new growth every day. That is the first indicator that they’re healthy and thriving in their new space, in their new pot. Am I giving them enough? Plants are complicated, but the one thing that is true for all species is that every new leaf means you’re doing it right. Recently, I met a delightful woman with an artist’s heart and a green thumb. I’m certain that few feel the way I do about receiving the gift of cuttings, because in the back of my wannabe-naturalist’s head, even I can’t quite understand the delight I feel as I run my fingers over the new material, feeling its bumps and textures. I delight further in researching the growth habits, the soil acidity, the amount of light it needs. I’m no botanist, but I understand the mechanics. So, when after all the leaves have fallen away and after weeks of wondering if I’ve managed it, I see new leaves sprouting and new roots reaching into the soil, I secretly squeal with glee that I’ve done a small thing to perpetuate the green in the world. I am amazed as well that something as lovely as a frangipani begins as a terrifyingly clawed gather of leaves as it reaches for the sun. People are the same. Something very ugly can eventually become something lovely, but it often takes patience, and encouragement and a bit of instinct. 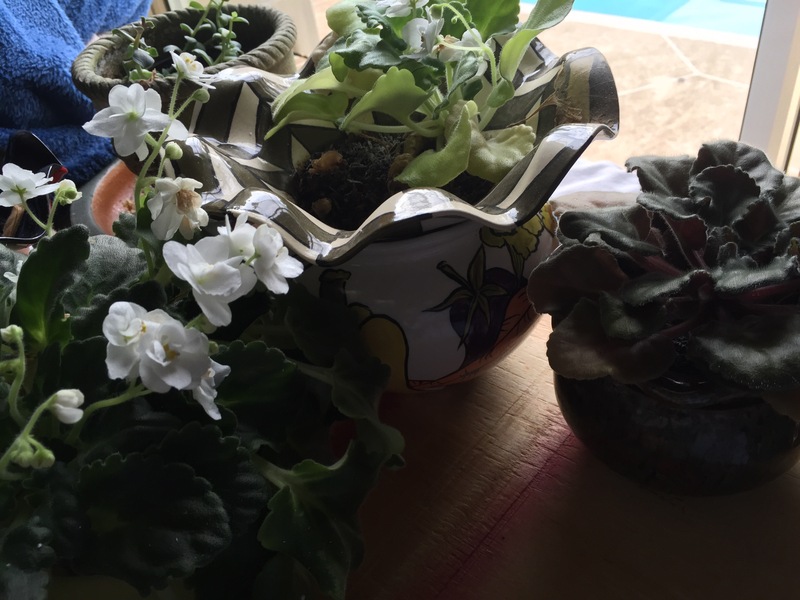 In 1998, I bought a little African Violet for my newly acquired apartment. The only bathroom was tucked away at the top of th stairs, functional and uncomplicated, as they were designed in 1928. The hurricane-proofed, cinder block walls made for a deep window sill in the shower, and here is where I put the 4″ plastic starter pot, overflowing with deep green, velvety leaves and royal purple flowers. African Violets love east/west light. In the right environment, they need little care and they will last years and years. Somehow, I happened upon a plant that is perfectly suited for my pale green thumb. Every time I need to undo some kind of stress, especially that particular type caused by narcissistic, careless humans, I go over to my violets and inspect them. I remove dying leaves. I check the soil to make sure that it is just moist enough. I nervously and reluctantly repot if it is “necked.” And then, when I see them bloom, I breathe deeply a satisfaction that surprises even me. I now have 7 flourishing plants, two of which are the result of my own propagating efforts. There is a school of thought, a philosophy, even a science called sun gazing. It expresses that idea that we are physiologically connected to the sun and everything that grows from it. It’s a bit new-agey, but to me, it makes sense that we are connected to the planet in a very organic way. That, I surmise, is why tending to and breathing on my violets has such a zen effect on me. Everyone should find some plant with which they connect. It’s good for the soul.